Youve got to understand, we are ideologues, Tom DeLay once told a journalist. We have an agenda. We have a philosophy. I want to repeal the Clean Air Act. No one came to me and said, Please repeal the Clean Air Act. We say to the lobbyists, Help us. We know what we want to do and we find the people to help us do that. We go to the lobbyists and say, Help us get this in the appropriations bill.It w… as a stunning admission. Lawmakers, DeLay was basically saying, relied on paid lobbyists to get bills passed, not the other way around. The federal government was so complex, the challenges of leadership so difficult, that lobbyists were more likely to get things done than the peoples representatives. And DeLay, because of his ideology, was happy to play along. The age of K Street had arrived. The Republicans were just along for the ride.from The K Street GangWhat happens when ideologues obtain power? 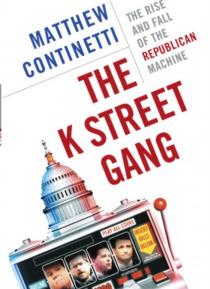 The K Street Gang is the inside story of how a group of self-styled Republican reformers succumbed to the temptations of power, becoming even worse than the Democrats they had been elected to replace. Now, some of those very reformers, including Tom DeLay and Jack Abramoff, are under investigation, their careers and reputations tarnished by the very system they helped to create. The story begins in 1994, when a landslide victory led to the first GOP-controlled Congress in forty years. The Republicans had it all: a visionary leader in Speaker of the House Newt Gingrich, a program for reform in the Contract With America, and a bonafide electoral mandate. They pledged to shrink government, reform politics, and drain the swamp of public malfeasance. Ten years later the Republican party finds itself embroiled in crippling scandals that have already brought about the fall of House majority leader DeLay and may reach all the way into the White House. In The K Street Gang, you'll meet DeLay, the brazen ideologue and prodigious fundraiser who invited lobbyists to run amok in exchange for campaign contributions; Jack Abramoff, the conservative activist who left a troubled career in Hollywood for a new beginning as a Washington lobbyist, only to fleece his clients out of millions of dollars; Ralph Reed, the former executive director of the Christian Coalition whose principles took a backseat to his business interests; Grover Norquist, the fiery antitax activist who provided intellectual ammunition for the Republican takeover of the lobbying industry, only to see the lobbyists take over his party; and Adam Kidan, a down-on-his-luck Republican businessman who engineered the scam of a lifetime-one that had deadly consequences.You'll learn how mysterious Russian businessmen with ties to Soviet military intelligence paid for Tom DeLay's trip to Moscow, then sold weapons to Jack Abramoff who resold them to militant Israeli settlers; how Grover Norquist helped arranged meetings between George W. Bush and men who are now alleged to be Islamic terrorists; how a former lifeguard rose from beachbum to aide to one of Washington's most powerful congressmen to high-powered and extremely wealthy lobbyist, and how he lost it all; and how a routine audit of an obscure Indian tribe's finances has led to a widespread public corruption investigation that threatens the political futures of half a dozen congressmen and the political future of the Republican Party.In The K Street Gang, Matthew Continetti takes us behind the headlines to meet a group of young idealists who came to Washington to do good and ended up staying to do well. It's about the perils of power and the high cost of greed. Above all, it's about how the American conservative movement began as a cause, turned into a career and ended up as a racket.